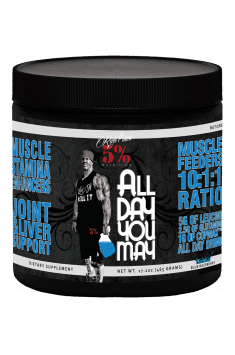 AllDayYouMay from the line of Rich Piana’s supplement 5% Nutrition is an advanced complex of substances supporting sportsmen in achieving their training goals. It comprehensively promotes regeneration and stimulates muscle tissue growth. Vitamin C – a powerful antioxidant, reducing the amount of free radicals in the organism. The factor stimulating oxidative stress is physical effort, therefore increased supply of antioxidants is recommended to people who are physically active. Moreover, ascorbic acid is conducive to regeneration and is present on the pathway of collagen synthesis, thanks to which it allows to preserve proper functions of connective tissue, which is reflected in the health of overburdened joints of sportsmen. Vitamin C also constitutes support for the immune system, allows to increase immunity to infections. Vitamin B6 – in the supplement it is present in the form of pyridoxine hydrochloride. It is present in prosthetic groups of enzymes, responsible for metabolism of nutritious substances, therefore its proper supply ensures efficiency of the energy system of the organism. It also has influence on protein changes in the organism. Apart from this, it may increase physical efficiency, as it has the ability to regulate the work of the cardiovascular system. It is also responsible for the proper functioning of the nervous system. Vitamin B12 – also called cobalamin, is an important factor conditioning the proper course of methylation, which is essential to derive energy from nutritious substances. It is a coenzyme in the conversion of homocysteine to methionine and methylmalonyl-CoA to succinyl-CoA, which are the key steps in methylation. Excessively low supply of vitamin B12 may therefore negatively influence energetic abilities of the organism. Moreover, cobalamin is a factor regulating erythropoiesis, i.e. the process of producing red cells. They are responsible, i.a. for distributing oxygen throughout the whole organism, enabling its efficient work. Cobalamin also positively influences the functioning of the nervous system and is present in the process of producing myelin sheath and its supplementation is conducive to psychological balance. Leucine – an amino acid belonging to the group of BCAA, conditioning the creation of anabolic environment in muscles. Its proper supply allows to fill the so-called anabolic window, i.e. minimal amount of leucin consumed in a meal, enabling the start of the process of tissue growth. It is an exogenous amino acid, therefore it cannot be produced by the human organism. Its high concentration is conducive to the processes of regeneration and is recommended to all physically active people. Isoleucine – a leucin isomer, also classified to the group of branched-chain amino acids. It prevents catabolism and promotes regeneration processes. It may also constitute the source of energy in the organism in case the drop in the concentration of glucose in blood. Lowering the level of isoleucine may contribute to increasing the feeling of fatigue. Valine – the last amino acid from the group of BCAA. Similarly to the remaining branched-chain amino acids, it has anticatabolic effect and stimulates regeneration processes. It may also cause slight stimulation thanks to the influence on the levels and activity of neurotransmitters. Phenylalanine – an exogenous amino acid, the supplementation of which may positively affect psychological functions, as it has influence on the production of endorphins. It is converted in the liver to another amino acid, tyrosine, which is a precursor for many important hormones, including adrenaline and noradrenaline, which have a stimulating effect. Tyrosine is also present in the synthesis of dopamine, responsible for positive emotional states. It also influence metabolism, which is one of the substrates on the synthesis pathway of thyroid hormones, thyroxine and triiodothyronine. Threonine – takes part in the synthesis of collagen, has positive influence on the state of skin and connective tissue, optimizing the functions of joints. Its proper supply is indicated as anti-depressant factor, positively influencing the state of the nervous system and psychological functions. Threonine also has influence on the functions of the immune system, regulating the production of antibodies. Histidine – is a precursor of histamine, thanks to which it positively influences the functions of the immune system. It also occurs in hemoglobin, enables its proper functioning. It also has influence on mineral balance of the organism, creates a complex with zinc, supporting its proper processing in the organism. Methionine – plays an important role in energy balance of the organism, being present in the process of methylation in S-adenosylmethionine. It influences many reactions in the organism, being a donor of sulfur. It stimulates the development of the nervous and muscle systems and is conducive to regeneration. Thanks to the influence on the synthesis of glutathione, it also has the ability to reduce oxidative stress in the organism. Proper supply of methionine also positively influences health of the circulatory system and is indicated as the form of prophylaxis of cardiovascular diseases. Glutamine – although it belongs to endogenous amino acids, the organism not always produces its proper amount by itself. It takes part in the metabolism of nitrogen, increased psychical work causes the drop of its concentration in the organism, which may be reflected in the reduction of the efficiency of work of the organism. Its supplementation increases training possibilities and facilitates regeneration processes. Apart from this, glutamine is indicated as a remedy for leaky gut, which may be caused by intensive training sessions. High concentration of this amino acid allows to prevent dysfunctions of the digestive system, which is related to maintaining proper metabolic functions. L-Carnitine tartrate – provides carnitine which plays a key role in the processes of deriving energy from beta-oxidation. It plays the function of fatty acid transporter, directing them to mitochondria, where energy may be derived from them in the process of oxidation. It has positive influence on energy functions of the whole organism and is also conducive to reducing fatty tissue. Carnitine also positively affects the synthesis of a stimulating neurotransmitter, acetylcholine, as it is a donor for acetyl groups on the pathway of its production. Taurine – an amino acid, the high concentration of which is characteristic to the organism in the period of intensive development. It intensifies metabolism of glial cells, thanks to which it positively influences the functions of the nervous system, increases cognitive abilities and facilitates memorizing It also plays the faction of creatine transporter, enabling its more efficient engagement in energy changes. This, in turn, influences energy production, especially during short-lasting efforts, such as sets of exercises during strength training. Complementing its level in the form of supplementation is important among sportsmen, due to the fact that during physical effort, the organism is not able to produce its sufficient amount. Coconut water – contained in the preparation in the form of extract is characterized by the content of electrolytes in the concentrations similar to blood plasma of a human being. In this way it perfectly hydrates and regulates electrolyte balance, which is considerably more disturbed during physical effort. Proper concentration of ions in the cells of the organism enables effective systemic reactions of all kinds and is one of the conditions of maintaining homeostasis. Alfa-hydroxyisocaproic acid – also called leucic acid, is a metabolite of leucin. Similarly to leucin, it stimulates muscle anabolism and prevents catabolism. It may also reduce post-workout muscle soreness. Moreover, there are certain studies suggesting antibacterial properties of leucic acid. Bromelain – a proteolytic enzyme naturally occurring in pineapple. It supports digestion of proteins, which often are the cause of digestive problems among physically active people. Sports diets are characterized by the high content of proteins, which often exceed the abilities of the digestive system. Supplementation with bromelain is an effective way to support digestion of large amounts of proteins. It also positively influences the functioning of the immune and circulatory system and has anti-inflammatory effect. Berry fruits – are commonly used due to their wide spectrum of pro-health effect. They are called plant insulin, as they are able to regulate sugar level in blood. They strengthen walls of capillaries, positively influencing the functions of the cardiovascular system. They contain the whole array of vitamins and have antibacterial properties. Creatinol O-Phosphate – creatine analogue, exhibiting, however, quite another mechanism of activity in the organism. It intracellularly buffers acid-base environment, neutralizing negative effects of increased secretion of lactic acid during physical effort, which is responsible for the creation of soreness limiting training possibilities. It may also support the functioning of the cardiovascular system, having neuroprotective effect. Beta-Alanine – is a precursor of carnosine, a compound playing a role of an intracellular pH regulator. It neutralizes harmful effect of lactic acid. It allows not only to increase physical abilities during training, but also to regenerate more efficiently after workout. It is conducive to restoring physiological acid-base environment, optimal for metabolic reactions. Summing up, 5% Nutrition AllDayYouMay is an incredibly complex product, providing active substances supporting the functioning of the organism of a sportsmen. It allows to supplement the compounds, which may be lacking as a result of intensive physical effort and provides ingredients stimulating anabolic processes and preventing catabolism. It is a universal diet supplementation, regardless of the discipline you practice or the level of advancement. Rewelacja. Tani nie jest, ale w trakcie porannych treningów na czczo - super. One serving (1 scoop) at any time of the day. The preparation does not contain stimulating or potentially harmful substances, therefore its dose may be adjusted to individual needs. I suggest increasing daily portions in the periods of especially intensive trainings, which are accompanied by caloric restrictions or in case of the lack of proper regeneration resulting from various reasons. Natural flavors and artificial flavors, citric acid, glucose polymers, acesulfame potassium, sucralose, silicon dioxide and Red #40.